Welcome, 2014! I hope everyone had a safe & happy New Year's. Mine was obviously not spent blogging! Actually, New Year's snuck up on me this year. I kept thinking I had an additional day in there. And I'm quite certain that if I had of had that extra day, I could have finished accomplishing all those 2013 goals. Oh well. That's the fantastic thing about New Years. It's like having a giant Do-Over button. I'm thinking that I may have accomplished more in 2013 than I realize though. Each year, I make my goals list, a list of 101 things I want to accomplish in the coming year. I used to do 101 goals in 1001 days but that never worked for me. I work much better under pressure. Those far away deadlines are just way too easy to ignore. So, I changed it to 101 things to do this year. Most of the items are to-do list type of things, not necessarily things like vacuum (although that is a lofty goal for me!) but non-routine type things like power washing the house. A few of the goals are of the stress inducing variety that will give me a good laugh in December when I review my list & have a good chuckle over thinking I could ever accomplish such a thing in only 365 days. And of course, there are a few purchases I'd like to make. But this year, for 2014, I couldn't come up with 101 things. I only have 96 on my list. Part of me is patting myself on the back for not having such a bad case of the I wants, part of me is thinking that maybe I'm actually making some headway in having the perfect life where to-do lists don't even exist, and part of me is going flipping insane trying to think of just five more items to complete my list. For some reason, starting the year off without 101 goals is driving me stark raving mad. Meanwhile, I'm very, very slowly working on one 2014 goal. PoorFish is modeling the sock I'm knitting. It's been a long time since I've knit myself any socks. I knit so many a few years ago, I swore I'd never knit another one but since I wear my hand knit socks daily & have the tendency to walk down the driveway to the mail box sans shoes, they tend to wear out. Item #2 on my 2014 goals list is obviously to clean PoorFish's bowl. Yikes! That water is looking a little cloudy. But hey, doesn't PoorFish look good? Since liberating him for his poor living conditions (& thus his name) at the pet store, his color has improved tremendously. Yep! Yarn salt & pepper shakers! 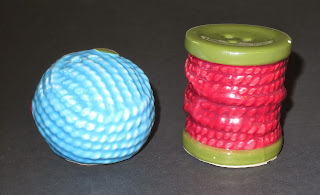 I'm not really sure why the one has yarn on a thread spool, but who cares! They are yarn themed salt & pepper shakers! My daughter gave them to me & she is now the official favorite child. My son received gifts almost as exciting. A one pound Reese's Cup and a crystal handled Solo cup. Red, of course! And Max, who always waits patiently. I would like to thank you for sharing your thoughts and time into the stuff you post!! Thanks for posting, definitely going to subscribe! See you on my reader. Me and my friend were arguing about an issue similar to this! Now I know that I was right. lol! Thanks for the information you post. Good writing. Keep up the good work. I just added your RSS feed my Google News Reader.. Thanks for sharing! I look forward in viewing more of these articles. I think all of us know the Monster beats pro, it is very good with high performance, and the best quality. Nice post! This is very informative! Great job! Kip on posting! Knitting is fantastic for soothing the nerves. Learning can be a little stressful but it just takes practice & before you know it, you'll find yourself in calm, knitting bliss.